Construction: Double flanged casing manufactured in mild steel or galvanised sheet steel, the impeller having manually adjustable pitch blades is made of PPG, PAG or ALU. Finish: Painting or galvanised after manufacture are normal finishes on all parts. Motor: Totally enclosed Class F motor, to a min. IP54 protection are fitted as standard. Standard motor up to 2.2kW are usually supplied on DOL starting, motor 3.0kW and above are star/delta starting. 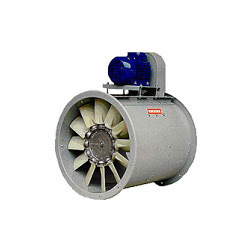 Incorporated in 2004, we, Sigma Enterprises, are among the renowned manufacture, supplier, distributor, wholesaler and service provider of a diverse array of Air Coolers and Geysers in the industry. Our offered range comprises of Wooden Coolers, Plastic Body Coolers and Stainless Steel Coolers. Our products are highly appreciated by the customers for their efficiency, optimal performance and longer service life. These offerings are designed in strict compliance with the prevailing industry and technological standards and are aimed at fulfilling the diverse requirements of the customers. We incorporate premium quality materials and cutting edge technology in the manufacture of these products. In addition, we also offer installation, repair and maintenance services for a wide variety of coolers. These services are carried out in accordance with the instructions of the customers and are rendered within the predetermined time frame. We have maintained an undeterred focus on achieving maximum possible customer satisfaction. For this purpose, we take several measures to understand the diverse requirements of the customers. Our products are designed to fulfill these requirements and are highly cost effective for the customers. In addition, we provide fair payment and delivery terms to the customers.